Listen to the sound of native birds as you enjoy water views through a canopy of native bush. A private new apartment under an existing dwelling. This unique property gives you the feeling of rural life while still being right in town. As you drive down the shared driveway to the guest parking you'll enter a sustainable organic garden and orchard that has a variety of fruit and citrus trees. Large glass surrounds maximizes the views to be found in the bush reserve and garden. On the main route to surf beaches 10 mins away or park up your car and have a scenic walk to cafes and beaches 5 mins. away. Tennis courts and sports fields across road. Immediately behind us is the track that traverses the Kaitoke estuary. Great for fitness or to view the scenery or marvel at the bird and estuary life. After a day out either at the beach or exploring the regions many adventures relax in the peaceful environment of this apartment. Shared driveway. Off-street parking available. Please park in designated area. Please note there may be an option to stay 1 night (depending on bookings). From Sept. 15th- there is a 2 night minimum. A cleaning fee of $20.00 is required. 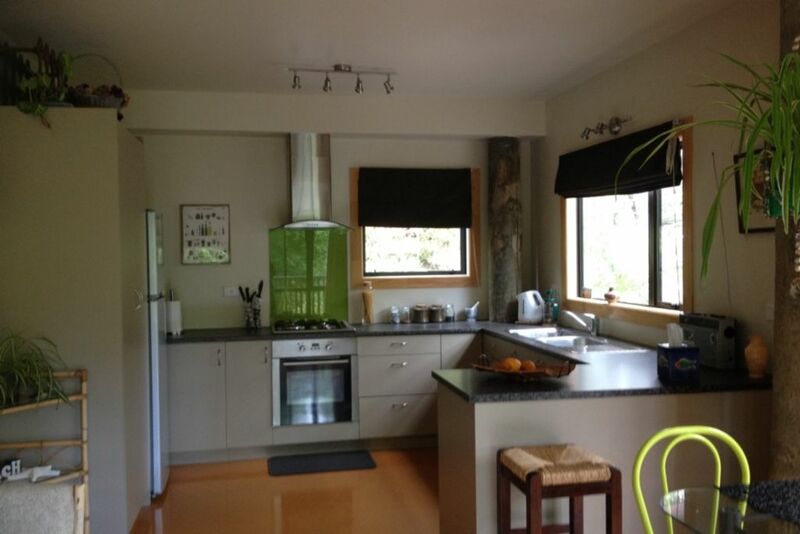 Views of inner harbour and direct access to Kaitoke Bush Walkway. Beautiful bush setting feeling secluded but so close to the township. Quirky and unique Raglan. Cafes(5+), surf(4), arts and crafts shops. Two local shopping stores to obtain food and drink. Town Escape is ideally located for a quick ride out to the famous surf breaks and beaches. A mere 10 min. drive from property,or a scenic walk to the Kopua camping grounds for a swim in the harbour. Uninterrupted views looking through the bush reserve to lush green hills of farmlands. A Peaceful view overlooking Kaitoki Bay and surrounding hillsides. The accommodations are first rate and Sue is a very nice hostess. We enjoyed our stay and highly recommend this beautiful property to others. Thank you for your kind words Tom and Martha. I'm so glad you enjoyed Town Escape and would love have you back sometime. Safe journey back to your beautiful SUttonsBay. Sue was very welcoming and helpful during our stay. A lovely property, very well appointed with more than you'd ever need for a short stay and fresh flowers to greet us. A very comfortable bed. Located in a lush (in spite of the drought conditions) setting with many fruit trees and access on to a walkway amongst the bush. Sue,s property was beautifully appointed and maintained, and I had an awesome stay there. A lovely, peaceful place for a quiet getaway. Très jolie maison perdue dans la végétation mais toute proche de la ville. Idéale pour se reposer et contempler le jardin aux multiples couleurs. We spent a long-weekend here and it was fantastic. Felt so secluded and relaxing. Couldnt have asked for more! Must see adventures would be Bridal Veil Falls, Te Toto Gorge, hiking up Karioi Mountain, kayaking or paddle boarding on the harbour, fishing, surfing. etc, etc..